New Delhi: Ahead of Republic Day 2019, rehearsal for the mega national event were successfully effectuated today on the roads of National Capital especially in the areas adjoined to Pragati Maidan and ITO. Following the rehearsals, a flock was gathered on roadsides, which was continuously under the surveillance of Delhi Police and other security forces. The foot-over bridges connecting to Pragati Maidan were close down and security personnels were present to keep an eye. The try-out continued for about an hour and the traffic was diverted for the smooth passage of parade cadets. 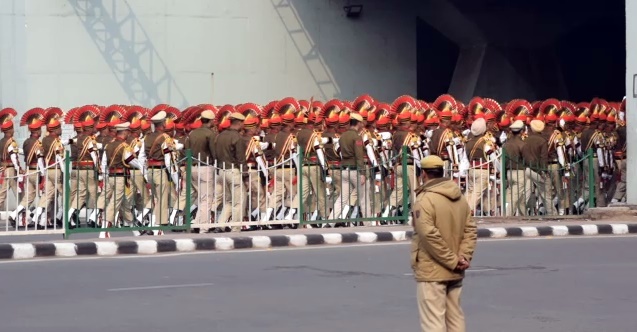 Delhi police has already announced the traffic advisory for Republic Day and Parade rehearsals. Following the Republic Day, Intensive checks are being conducted every day in the National Capital to ensure an incident free environment. Delhi Police is also Patrolling and checking in public transport along with Nakabandi at the borders and area checking with Raftaar motorcycles.